The Super Soaker Triple Shot, released in 2005, is one of the best and possibly the most powerful of the pistol-sized water blasters ever released. Introduce by Hasbro Inc. in 2005 along with the rest of the Soaker Tag Elite series, the Triple Shot was the smallest of the new water guns released under the Super Soaker brand that year. However, compared to all other pistol-class water blasters before it, few would expect to see the performance this particular model would give. 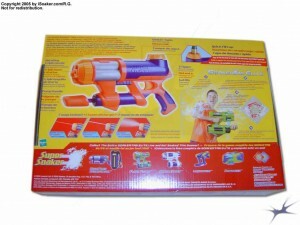 The Super Soaker Triple Shot is partially obscured by its packaging. While its nozzle selector, reservoir, cap, and trigger are visible, its pump handle and grip regions are hidden behind the forward cardboard panel. Though not as clear from this broad view picture, the Triple Shot is notably wider (deeper) than most other pistol-sized water blasters, even by today’s standards. The “lifestyle”-type image on the lower-right corner of the box makes it appear like the Triple Shot produces some massive blast of water as opposed to typical stream-type representations, but how accurate is this? A side view of the box shows off part of the nozzle selector as well as revealing more clearly just how deep this box is. The Triple Shot is perhaps as wide as many water blasters that are twice as long as it is. Unfortunately, back in 2005, the number of box images I opted to capture was limited, thus I do not have any 3/4 view images to give one the sense of how much of the pump and grip regions are visible when looking at the packaging at an angle. Nevertheless, the back side of the box shows off what the Triple Shot should look like once it is free from the packaging. A few of the sub-panels on the back attempt to illustrate the Triple Shot’s three nozzle settings. One other feature that has not been used much since is the Quick Fill Cap whose functionality is described towards the top-right of the back panel. There was also a section of the back dedicated to explaining how Soaker Tag games should work. While I will give Hasbro credit for trying to help create a more objective scoring system for water warfare, due to the non-reusable and somewhat messy nature of the SoakerTags, themselves, gameplay that relied on having SoakerTags readily available never seemed to really catch on. Though seeing the Super Soaker Triple Shot on store shelves is nice and all, seeing a water blaster compared to holding and using a water blaster are rather different experiences altogether. Free from its packaging, the entirety of the Triple Shot from its grip to pump to reservoir to nozzle selector comes into clear view. 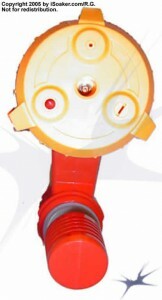 As alluded to on the back panel of the box, the forward-mounted pump grip sticks out slightly farther than the nozzle selectors and does not sit flush with the pump shaft. Colouring of this particular Triple Shot is somewhat different than the version shown on the back panel, though the existence of other colour versions cannot be ruled out. The build of the Triple Shot is nice and solid. The trigger-grip region is perfectly positioned to be vertically centered with the forward-mounted pump. This allows one to automatically be at optimal pumping geometry to transfer the most force during each pump stroke. The trigger-grip area is very well designed and its open nature allows virtually anyone’s hand to fit comfortably. The pump grip is slightly on the short side for those with larger hands, but functions well. The Triple Shot’s square pump rod prevents the pump grip from rotating during pumping. One of the less common features of the Super Soaker Triple Shot is the presence of a nozzle selector. 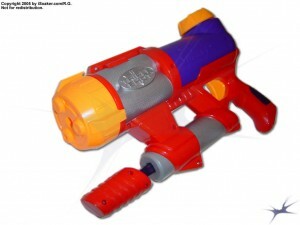 Being a pistol-sized water blaster, the Triple Shot’s nozzles all depend on the potency of its pressurized reservoir. As can be clearly seen, the three nozzle options are rather distinct: 1) a standard stream-type nozzle, 2) a fan-type spread nozzle, and 3) a larger stream/riot-blast type nozzle. Once fully pressurized, the Triple Shot easily powers any of the selected nozzles well. The standard stream setting performs as expected, pushing out roughly a 1.5x stream (~45mL/sec). The fan setting offers increased area coverage at the cost of range, pushing out close to a 2x output (~60mL/sec), but at only slightly more than 50% the range of the stream nozzle. 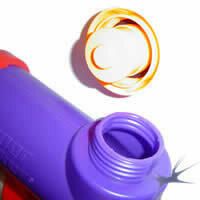 The Triple Shot’s biggest surprise is its large nozzle/riot blast setting. A properly filled and fully pressurized reservoir allows this nozzle to achieve an output close to 7x (~210mL/sec)! 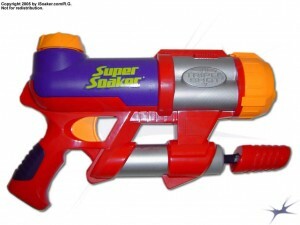 To put this another way, the Super Soaker Triple Shot can push out more water-per-second than a Super Soaker CPS 1000 despite being less than half the size! Of course, the Triple Shot cannot sustain that level of output for long – shot time is listed at ~1s though it is probably closer to 0.5s had I measured it more accurately. Also, given the fact that the Triple Shot is a smaller blaster, a notable recoil can be felt when using its largest setting. While it dramatically reduces one’s field life, few would expect such a drenching burst to be unleashed by a water blaster of this size. Of course, that drenching blast burns up all the pressure in the reservoir so if the shot doesn’t connect or it you’re up against more than one opponent at a time, you’ll find yourself defenseless until you can repump the blaster. The Triple Shot’s reservoir holds a respectable amount of water for a blaster of this size. As noted above, the reservoir is accessible via the Triple Shot’s Quick Fill Cap. With a hose with adequate pressure, the reservoir can be refilled without needing to unscrew the cap simply by jamming the hose’s nozzle into the top of the cap to open the valve. This, however, only does a mediocre job at pressurizing the reservoir and it is still highly advisable to pump in more air to improve stream performance. The small size of the Triple Shot makes it easy to carry around as a back-up in larger battles, but can be used alone in smaller skirmishes or when out on a scouting mission. While a little large for average pockets, the Triple Shot can fit into some larger pockets and easily into light backpacks. That said, my own experience with the Triple Shot in battles is limited. While I have successfully used it for a couple of events, most of the battles I participate in are Free-for-Alls minimizing the value of back-up blasters. Also, while the Triple Shot is probably the most powerful pistol-sized water blaster, it is not my all-time favourite pistol-class water blaster. 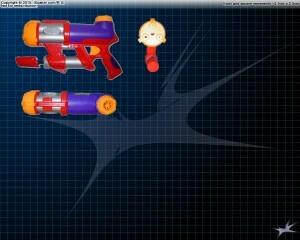 Those familiar with iSoaker.com would likely be able to guess what small water blaster is my favourite. 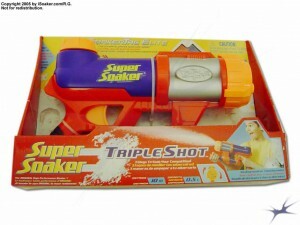 Altogether, the Super Soaker Triple Shot provides great power in a small, sturdy package. 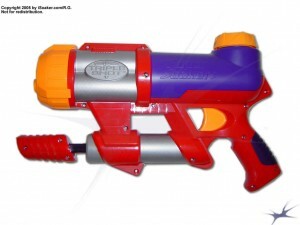 It is also one of the few water blasters that generate enough force to produce a noticeable recoil kick. Great on its own or as a potent back-up water blaster, the Triple Shot can provide you with the added confidence on the field and a powerful surprise to any foolish opponent who comes too close. Its ability to be refilled from a hose without needing to unscrew its reservoir cap makes for faster refilling if the hose pressure permits while its nozzle selector offers a variety of options to best suit your battle situation. 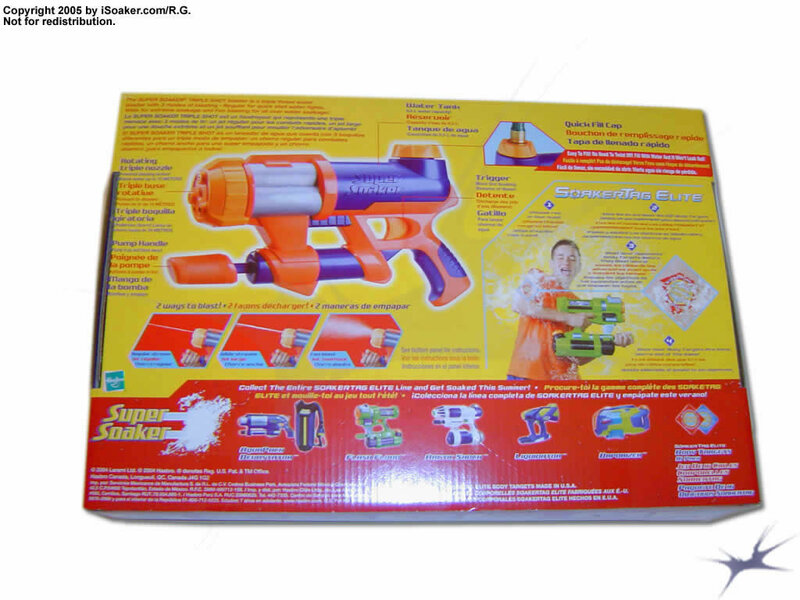 A great addition to any armoury, it is unfortunate that no water blaster since the Super Soaker Triple Shot has offered the same mix of power and flexibility in a nice, compact package.